All have large image banner, with the site name and organization name top and slightly-left. All have basic navigation buttons across the top (above or below the banner), and all have a “donate now” button top right. All have very strong thematic schemes (not the same theme, but all very clear, strong choices). Charity Navigator and CURE have LOTS of informational links on their front page; United Way somewhat fewer–but scrolling content adds to landing page info. Both Charity Navigator and CURE have a significant footer navigation menu, which is consistent on all pages. 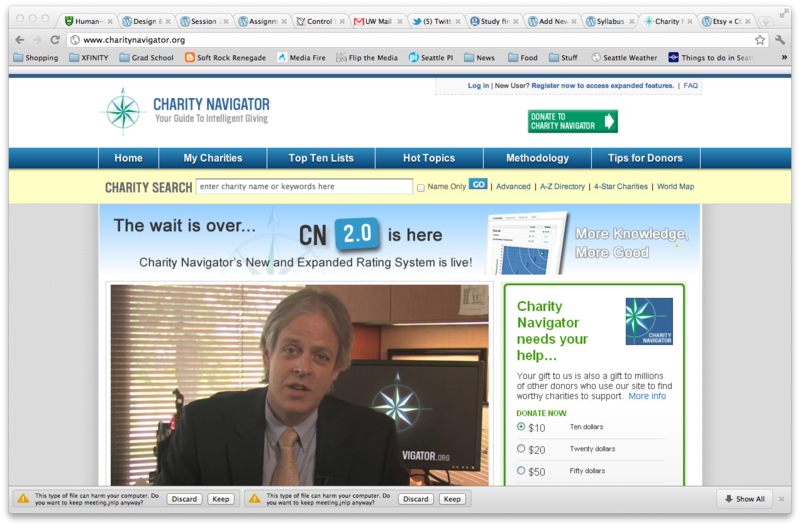 Charity Navigator is very “clean” professional design–inspiring confidence in a $-based site. 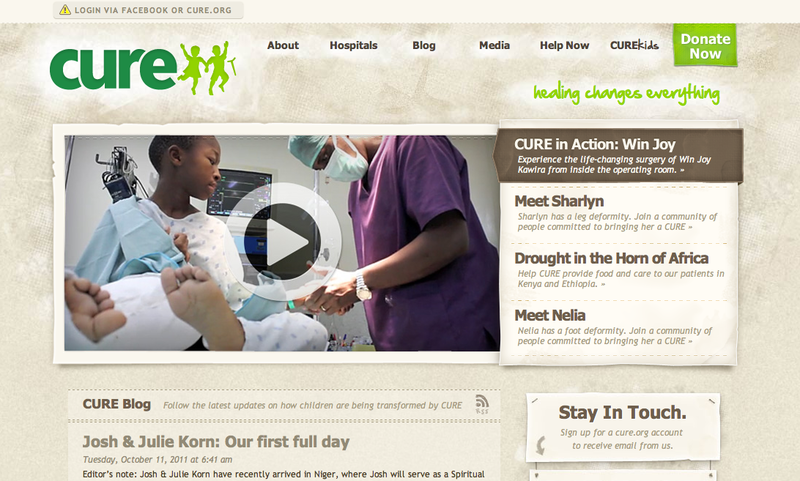 CURE’s site is very naturalistic, with pictures and blog posts that humanize the effort. United Way has lots of cheerful pictures, inspiring good feelings. CURE has a link to Charity Navigator (and two other vetting orgs) on their front page. CURE’s big LP banner is not broken into columns, as Charity Navigator’s and United Way’s are. United Way has a Spanish site option at the very top of the page. CURE has a neat ‘hover-over’ on their logo, which says “Return Home,” reducing navigation confusion. Christian is a 25-year-old computer scientist who just landed a plum job at a local start-up. He was born and raised in a small midwestern town, and attended his state university on scholarship from his church, where his parents are very active. Christian has no spouse or children, and has only moved to Washington recently for his new job. Prior to the move, Christian was very active with his local Big Brothers group and the soup kitchen his parents’ church sponsors. The oldest of five children, he is used to doing things for himself, and making his own decisions. Christian is an avid fan of classic, old-school rock-n-roll, and football. As a single man, a hefty salary also means a hefty tax load. Christian’s mother is an accountant, and has advised him to do some pre-tax investing, but also to find a charity to donate tax-free money to. He asked some of his fraternity brothers for ideas–the three websites listed are the suggestions he remembered. In the back of his mind, he is also considering volunteering time, in order to meet new people in his new hometown. Christian begins by typing “Methodist” in the search box. He follows the American University link, which (with four stars), seems a good option (and one that would please his mother). He then wonders how Charity Navigator analyzes the data it receives, and clicks on the Methodologies link at the bottom of the page. He reads all of the sub-pages there, and decides that he will use Charity Navigator to vet all of his other charity potentials. CURE International rates a solid three-stars, and United Way Worldwide is almost off the chart in four-star territory. Leaning toward the four-star option (and having forgotten his initial search), Christian still decides to visit both of the other recommended sites. From the CURE homepage, Christian first follows the “financial accountability” link. From there, he finds himself back at Charity Navigator, linked by CURE. He then notices that there are reviews for CURE on the Charity Navigator site, and follows the link to CURE’s reviews. Back on the CURE site, he clicks on the “Ways to Give” link, following the sub-links there to see what his options are. At this point, he decides he’s learned enough to look at his third charity. 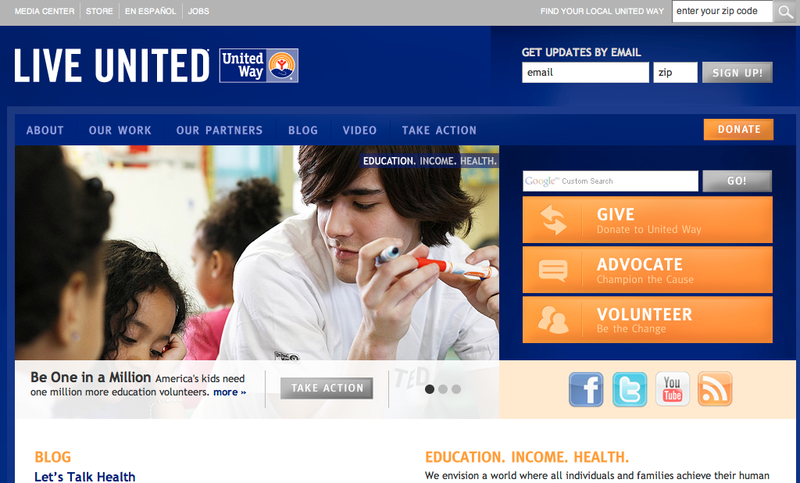 From the United Way homepage, Christian clicks on “Our Work,” and follows the sublinks for education, income, and health. Liking what he sees, he goes back to Charity Navigator to see what United Way’s reviews look like. They (surprisingly) don’t have any. 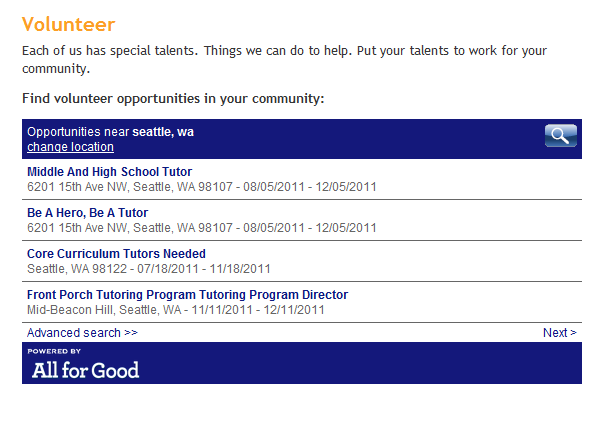 He still decides to navigate to United Way’s “Take Action” page, and see what options they list. The page not only has donation and advocation links, but provides Christian with local volunteer needs–pretty awesome! Ultimately, Christian opts to give a one-time donation to Charity Navigator, monthly to CURE, and donate his time (and, he’s sure, semi-regular incidental purchases) to his local United Way. Help users find worthy recipients for their charity dollars, aligned by any number of search terms. Create enough cash-flow of their own to maintain their service as a free one. The very clean, simple layout really makes the viewer feel that this is a reputable, fiscally-responsible organization. There is a LOT of information there, but the design keeps the page from feeling messy. Navigation is very easy, both through a simple (and very effective) search bar top-center, and through browsing by category (just below the main story frame) and numerous top-ten lists (just below the by-category). Sub-pages retain the top and bottom menu areas, with the center frame displaying the requested data. The basic blue/cream/white color scheme is not exciting, but not at all distracting, and adds to the “trust me” feel of the site. The one thing that does detract most is the presence of advertisements. The color scheme is very naturalistic, with bold green accents to give it a zap of energy. Most of the pages have at least one picture of a child (current or former patient), and often many children are pictured. The blue background is a very strong color, but in this context, it comes off as vibrant and positive, almost cheerful. The orange accents continue that trend, and combined with the pictures of smiling volunteers, teens, and children, the entire feel is uplifting. This is an organization that doesn’t just help, it makes people feel good. Who doesn’t want to give money to that group? Who doesn’t want to be a part of that group? It is a really effective design. Very thorough! Individual touches in implementing required components.